The first one-day Education Abroad Expo hosted by Crimson Consulting is being held in Johannesburg for high school students looking for an international education experience. 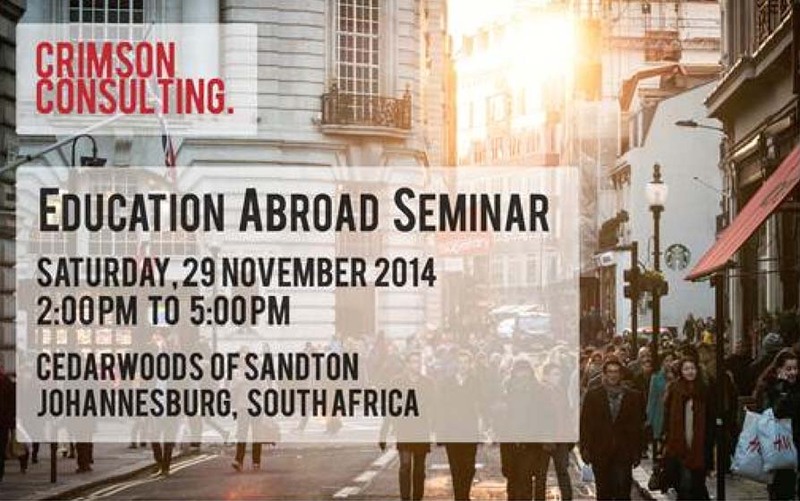 We are hosting an Education Abroad Expo at CedarWoods of Sandton on the 29th of November 2014 for high school students around the area. Members of our team and speakers in the know will be addressing attendees about the entire application process from selecting schools to which to apply, to first hand accounts of the international student experience. Speakers include ex-admission officers and current students such as Durban-raised high achiever Virgil Marais, of the most recent group of accepted freshman to Harvard University. Crimson Consulting was born out of a lack of assistance for students in New Zealand and Australia who aspire to study at universities in the Ivy League, and Oxford and Cambridge. We are a full service education consultancy and tutoring facility with a difference: in addition to our undergraduate consultants, our team includes ex-admissions officers from Harvard and Yale. Our unique service is based on the combined expertise of these officers, and of local tutors and consultants. It is our job to show South African students the path to international success. We are here to empower them, guide them in this process to maximise their potential, and ensure they get the largest financial aid package they can. We are committed to getting them to the most selective, most stimulating, and most rewarding schools possible. Our team of consultants among them succeeded in gaining entry into Harvard, Yale, Oxford, Cambridge, Stanford, Columbia, Brown, University of Pennsylvania Huntsman Program (Wharton and the College of Arts and Sciences Dual Degree), Duke, Melbourne, Monash and other institutions. This picture is available for your use. Find the Facebook event here and feel free to contact the organisers with any questions.